John hancock—26 words. 26 Miles. 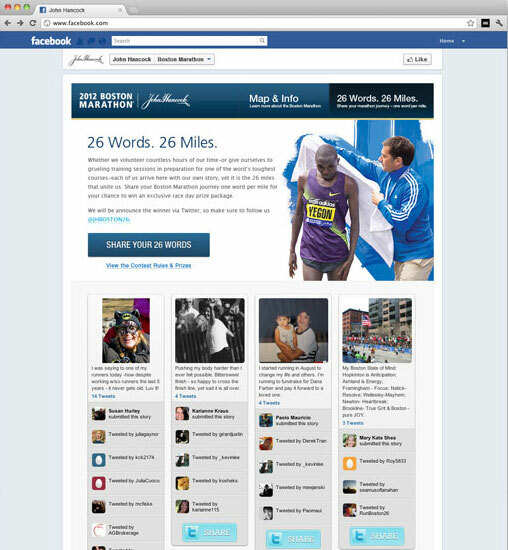 With one month to go before the start of the 116th Boston Marathon (2012), John Hancock wanted a new way to promote the renowned road race while also raising their visibility on Twitter and Facebook. Whether we volunteer countless hours of our time—or give ourselves to grueling training sessions in preparation for one of the world's toughest courses—each of us arrive here with our own story. Yet it is the 26 miles that unite us all. Share your Boston Marathon journey one word per mile for your chance to win an exclusive race day prize package. Posting a hashtag-driven Twitter feed on the John Hancock website could easily be done, and live feeds are routinely done every year in the local media space. This is a great way to provide updates, but why not see the Boston Marathon in the eyes of the runners, volunteers, and spectators? And capture these thoughts and images against the backdrop of what makes the Boston Marathon what it is -- the famed route extending from Hopkinton, MA to Copley Square in the heart of Boston's Back Bay. To capitalize on three popular social platforms, we created a map of the Marathon route in Facebook to broadcast the information shared through Twitter and Instagram. By placing the social map into John Hancock's existing Facebook page, we created an opportunity to build Hancock's Facebook fanbase by requiring users to "Like" Hancock in order to view the map. Rather than create a unique hashtag, we chose to go with something quite logical and already in use: #BOSTONMARATHON. 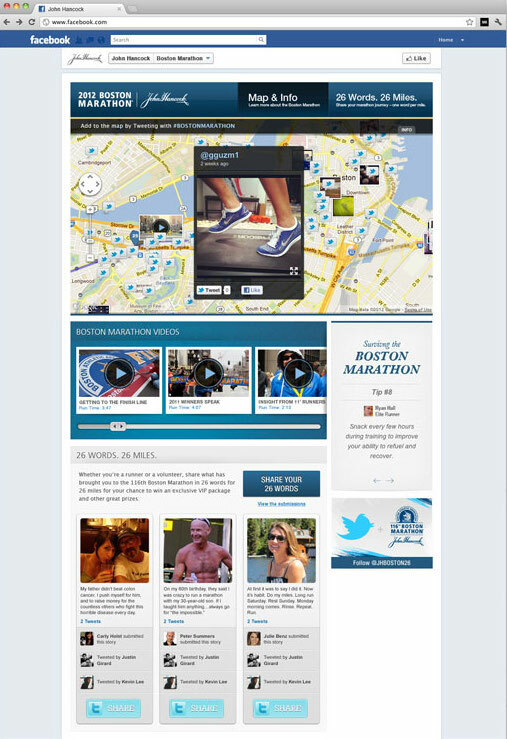 Many Twitter users would naturally use this when Tweeting about the marathon, and by making this what powers the interactive social map, it would also organically draw attention to Hancock's Marathon-specific account @JHBOSTON26. Don't just read it. See it. When it comes to pulling photos, Instagram was always the obvious choice -- delectable UI, accessible API, near seamless integration with Twitter, and high number of active users. But we definitely benefitted from the timeliness of Instagram both launching an Android version of their photo-sharing software and something about Facebook and $1B. The result? Between the time the interactive was launched in early April until April 18, over 3000 photos were tagged with #BOSTONMARATHON. Cross-promoting Twitter via Facebook can often be difficult, especially since users tend to use the services in different ways. How do you make users create meaningful content for use on both platforms, while also adhering to Facebook's stringent promotion guidelines. We needed to encourage the creation of personal content on Facebook that would in turn be shared through Twitter AND promote the interactive social map. Adding a contest layer encourages participation, and perhaps it would have been easy to go with a simple why I run in the request for submissions. But John Hancock didn't want to just target runners, but also the volunteers who help make this event happen. Some people can espouse upon their goals ad nauseum, some cannot. The key was to make it mildly challenging while also fostering the creation of thoughtful brevity. Solution: 26 words for 26 miles. Before the promotion, John Hancock counted 1467 Facebook fans. At the conclusion of the event, their following increased by 70%. One month before the race, 2500 Twitter users followed @JHBOSTON26. The morning after the Boston Marathon, this number was 6500. Over 11,000 Tweets were tagged with #BOSTONMARATHON during April 2012.